Before you pay for something online, take a moment to ensure the website you’re using is legitimate. Fake websites have made the news in southeast Michigan several times this year already. From fraudulent donation websites to fake NCAA tournament tickets, Michigan consumers need to be wary of where they spend their money online. In September, WXYZ Detroit reporter Ameera David commented on how to avoid fraud, scams when donating to Florence relief. She notes that every hurricane season is a prime opportunity for scammers and spammers to take advantage of those willing to give. “Hurricane Katrina was a benchmark disaster for charity fraud, leading to more than 1,200 federal prosecutions of disaster fraud. Complaints following last year’s Hurricane Harvey were consistent in number,” Call for Action, an international, nonprofit network of consumer hotlines founded in 1963, reported on its website. The message is very urgent. This could happen on a website, the phone, or even in person. Be very weary of phone calls for Florence relief donations, and be sure to pay attention to what the caller says. Does she repeat the urgency of the need? Does he offer to come to your home and pick up your donation? They refuse to give info about the charity. Instead, they may ignore your questions or even hang up the phone. If you ask a straightforward question regarding your donation, you should expect a professional answer. If the answer leaves you feeling confused or your question unanswered, take a step back before donating. You don’t know how your money is being used. If you visit a donation website, and cannot locate any information about how your donation money is going to be used, it’s likely that you’re the target of a scammer. Cash only. Many times, scammers ask for cash donations, only. Why? Cash is difficult to track and is therefore much easier to launder. The e-mail address doesn’t match the charity name. If you receive an e-mail, check it thoroughly before opening it or clicking on a link within the e-mail. If the sender’s e-mail address is from a free, generic account like @gmail.com or @yahoo.com, this is a red flag. A legitimate charity will send an e-mail from a recognizable e-mail address, such as @redcross.org. Closely examine the website you’re on before agreeing to pay anything. Read the text to make sure it makes sense. On spam websites, many times the content (text, photos, etc.) will be poorly written, designed, or produced. Look at the website address. 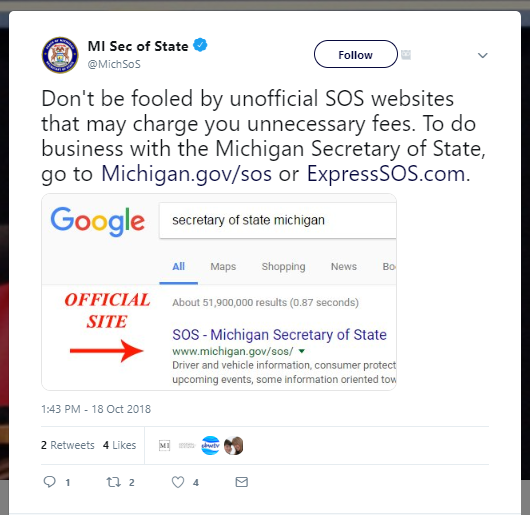 Is it an official Michigan government website? If so, the URL will end with .gov, as in www.michigan.gov. If the website address sounds fake or odd, leave it. Then, go to Google and search for “official website”. Do not pay for services that SoS may offer for free. Additionally, do not accept free services that you normally pay for. Do not share your personal information. This includes your full name, address, credit card number, e-mail address, phone number, or any other passwords or account logins. 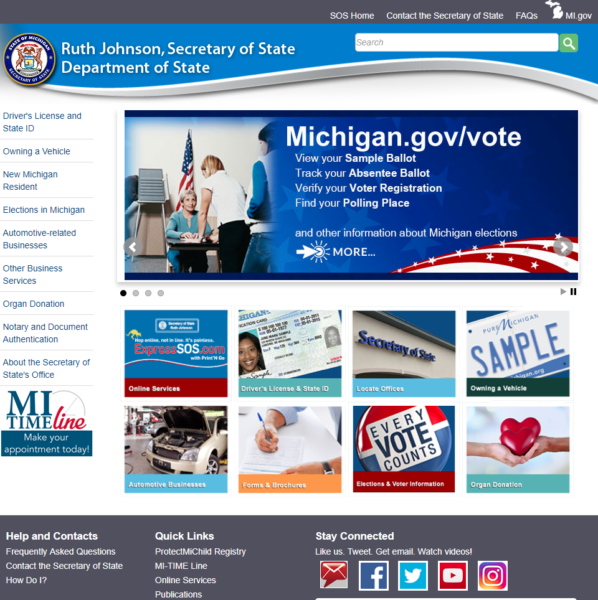 The office website of Michigan Secretary of State. A pop-up warning appears on your computer screen, and you may also hear a high-pitched alarm. The pop-up warning is branded with a logo or image from a company like Microsoft, HP, Apple, or Dell. The warning alerts you to the fact that you have a computer virus or malware on your computer. A phone number is listed, and you are directed to call immediately for tech support. You call the phone number, and a technician answers. He offers to repair your computer issues in exchange for a payment. The tech also asks to access your computer remotely, so she can scan your computer for viruses, malware, etc., and then resolve those issues. He may also offer to add protection to your computer to prevent future attacks. In the study, BBB notes that the cost to you is often quoted at $500 or more. You pay the fee. You agree to allow the tech to access your computer and fix the issues. “Consumers have described sitting in front of their screens – sometimes for more than an hour – watching as a remote operator controls their computers,” BBB notes. During this session, the tech may also install spyware onto your computer, copy login and password information, or access account security information. The tech finishes your computer and ends the call. In another scenario, the scam begins when you receive an unsolicited phone call from a tech who claims that your computer has a virus. The screenshot below is from an informative article from Malwarebytes Labs called PSA: Tech Support Scams Pop-Ups on the Rise. 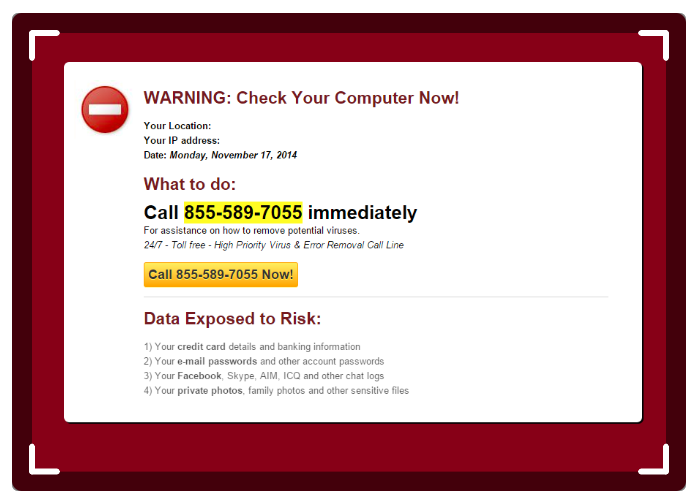 View the article to see more examples of fake pop-up warnings. A screenshot of a pop-up ad, referenced by Malwarebytes Labs. BBB’s website offers excellent advice about spotting the scam. It suggests computer users never give remote access to someone they don’t know or haven’t contacted. Also, legitimate tech support companies, like Artonic, do not call out of the blue to tell you that you have a computer virus. This is a classic way that online scammers get in contact with victims. In March, Michigan’s Attorney General, Bill Schuette, issues a Consumer Alert concerning online ticket purchasing for NCAA Tournament tickets in Detroit. ClickOnDetroit, a news outlet, reported on the announcement in the video below. Remember, if you’re getting a deal that seems too good to be true, it probably is. 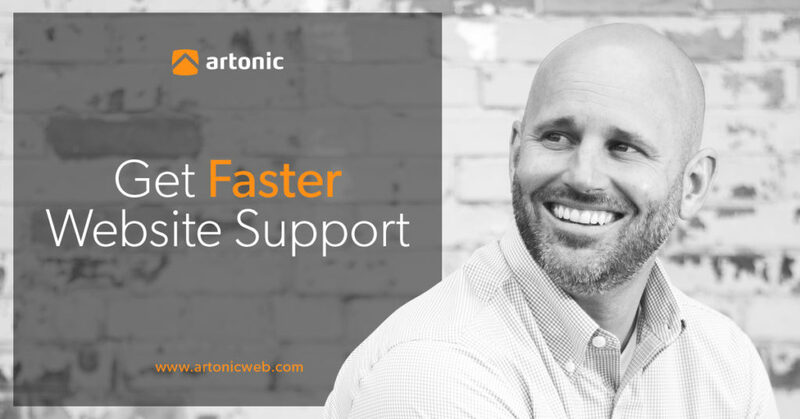 Artonic offers legitimate, professional website and tech support for its clients in southeast Michigan.